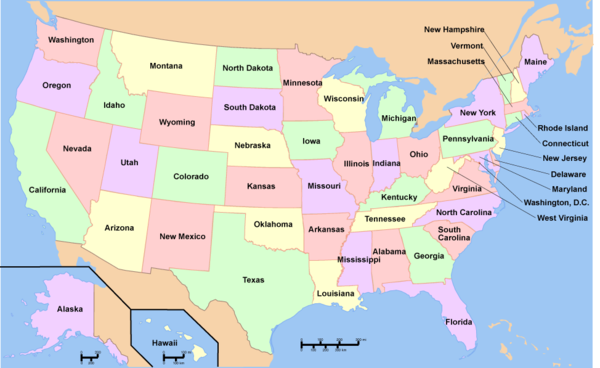 Counties with Industrial Silica Sand Bedrock. Fracking for oil has grown in neighboring North Dakota, and much of the sand used in the fracking process is coming from Minnesota. A fracked well can use approximately 10,000 tons of industrial silica sand to prop open fissures and increase the flow of fluids and gas within a well. 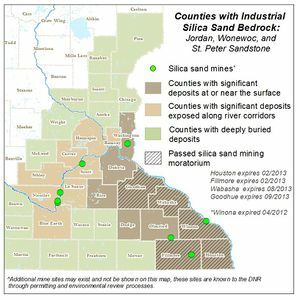 As of February 2013 there are eight silica sand mines in Minnesota. In response to the increased demand for sand from fracking, companies are seeking permits from local governments for new silica sand mines and to expand existing mines in the state, as it is up to counties and townships to regulate silica mining in their area. Opponents have called for a statewide moratorium until permitting is established, and some cities are banning mining expansion until regulations are put into place. Four counties, Goodhue, Wabasha, Houston, and Fillmore, have moratoria on new permits for industrial silica sand mining. In November 2013 Enbridge filed an application to build a $2.5 billion oil pipeline called "Sandpiper" across northern Minnesota. The 610-mile line would carry more than 200,000 barrels of tight oil per day from western North Dakota's Bakken shale fields to the company's terminal in Superior, Wisconsin. Enbridge has proposed two routes for the new line. One would follow its existing pipeline corridor. But the company's preferred Minnesota route cuts a new path south to Park Rapids before turning east toward Superior, through Carlton County. The Minnesota Public Utilities Commission will weigh landowner and farmowner concerns against the need for Sandpiper - one of three proposed new pipelines from North Dakota that could cut across the state in coming years. If the PUC approves, Enbridge plans to begin building by late 2014, and landowners would not be able to say no to the pipeline running on their property. Sand has been mined in Minnesota for more than a century. Round silica sand beneath the bluffs near the Mississippi River in southeastern Minnesota and western Wisconsin has been mined to make window glass, water filtration products and abrasives. Recently, several Minnesota communities have passed moratoriums on mining so they can study the practice, which has already impacted parts of Wisconsin. Currently the Minnesota Pollution Control Agency along with other state agencies are in the process of writing new rules for frac sand mining as part of a plan ordered by the State Legislature. Goodhue County in Minnesota has enacted frac sand moratoriums, citing a lack of studies on impacts on such mining, such as pollution and road safety. ↑ 1.0 1.1 Tim Blotz, "Frac sand concerns heard at Minnesota Capitol," KMSP TV, Feb 19, 2013. ↑ "Industrial Silica Sand: Frequently Asked Questions and Answers," MN DNR, updated Oct 31, 2012. ↑ Dan Kraker, "Enbridge files application to run pipeline across northern Minnesota; opponents gird for fight," Minnesota Public Radio, October 28, 2013. ↑ "Frac Sand Mining "Frac Sand Mining" MPR News, May 2013. ↑ "Goodhue Co. extends frac sand moratorium" Elizabeth Dunbar, MPR News, August 6, 2013. This page was last edited on 4 November 2015, at 22:21.